The above drawing shows the “original” design, with a negative feedback resistor divider network consisting of the serial R19 resistor (33k) feeding the signal into the cathode of the input tube, and into the shunt resistor R2 (470 ohms). In other words, I need at least a fraction of the output voltage, as above, to maintain a “status quo” in terms of the amount of negative feedback within the global loop. But now, let’s convert this into a Current Drive amplifier. Instead of taking the feedback signal from the hot (‘top’, “8 ohms”) terminal of the speaker, we shall rather take a sample of the feedback voltage from a high power, inductance-free “R Series” resistor, which is connected in series with the speaker. Specifically, between the return of the speaker and signal ground. This resistor, as opposed to the speaker, is a linear device. It is NOT an impedance, as the speaker is, but a true (almost true) pure resistance, that very much complies with the U = I * R rule, both in the DC as well as in the AC domain. The more “ideal” this resistor is (i.e. inductance-free and parasitic capacitance free), the more “ideal” current to voltage mapping we shall obtain. Say what ? 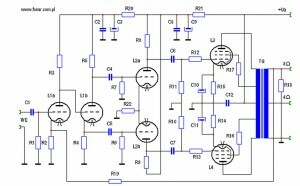 What Current to Voltage conversion ? Well, yes. There is a current flowing through the speaker. It is the current that moves it’s membrane. Hence, we want the negative feedback loop to precisely control this CURRENT flowing through the speaker, and not the VOLTAGE on the speaker terminals. So, in other words, we need to measure this current, sample it, and convert it, in an as linear as possible manner, into a sample voltage, a voltage that we can feed back into the negative feedback loop. Nothing changes ? Sort of. Nothing changes in the fact that the cathode of the input tube receives a negative feedback signal voltage. But apart from that: EVERYTHING changes. 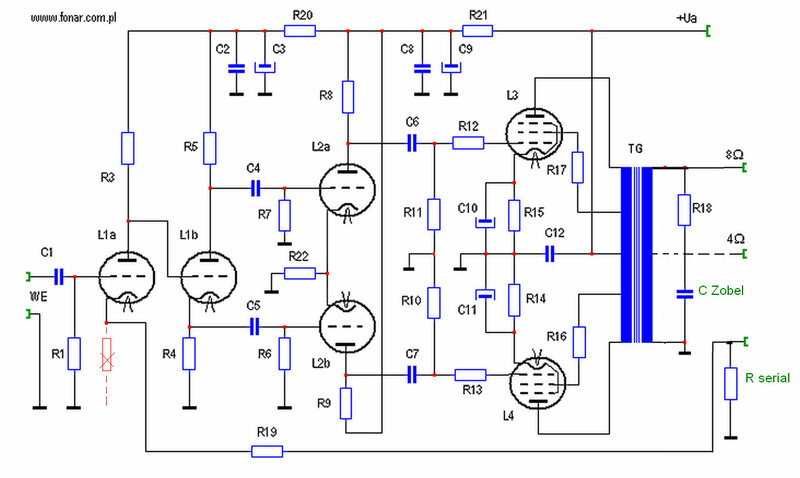 Because this voltage is a current-to-voltage converted derivative of the CURRENT flowing through the speaker. The current that actually MOVES the speaker. Let’s assume that we want to drive a speaker with an impedance of 8 ohms. The 8 ohms impedance, connected in series with the I-to-V sampling R-Series resistor, constitutes a voltage divider network. 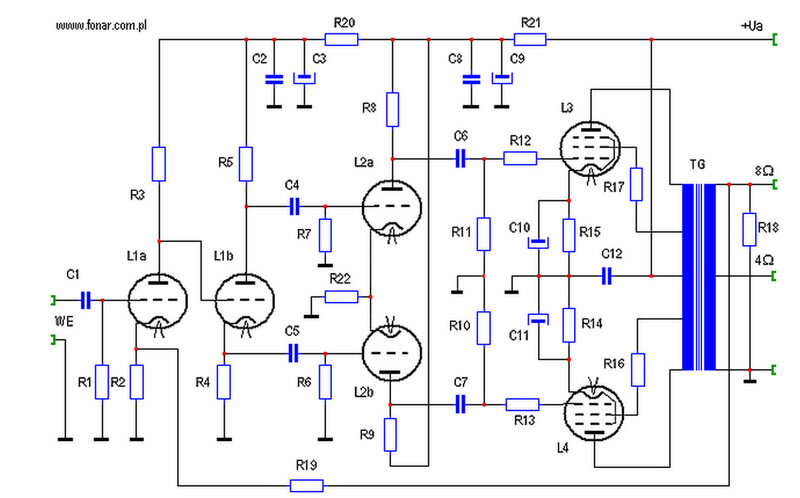 If we achieve the same voltage division ratio, as within the original schematic, the circuit, in terms of overall gain performance, should work unchanged. 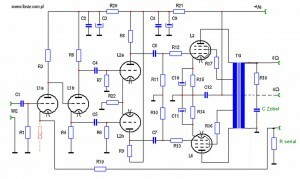 But how much should the R_Series resistor be ? Obviously, it should not be too high in value, so that we do not waste too much power on it. But at the same time, if it is too small in value, the value of the I-to-V feedback voltage will be too small so as to maintain a status quo. Basically, we need to make a fraction of the “output” voltage to return to the cathode of the input tube. But, … wait a minute …. Now we have a NEW voltage divider. The upper resistor is now the 8 ohms impedance of the speaker itself. The lower resistor is the value of the R_Series to commons. 0,014042426… Division_Ratio = R_Series / ( R_Load + R_Series). R_Series = R_Load * ( Division_Ratio / ( 1 – Division_Ratio ) ). R_Series = 8 ohms * (0,014042426… / ( 1 – 0,014042426…. ) = 0,114 ohms. So, in other words, we totally get rid of the “traditional” commons connection of the cathode resistor of the input tube, with would “normally” be routed directly to commons, but alternatively route it rather to the top of our R_Series resistor. that roughly represents the same voltage divider relations as in the original design. I say roughly, because please remember that the 8 ohms is an impedance, and not a resistance (actually, the impedance of a speaker varies over the frequency range). What we are trying to achieve here is a more or less equivalent environment in terms of gain as in the original design. But please remember that we are essentially working here with current, which is converted back into a feedback voltage on the series resistor, R_Series, of a value of 0,114 ohms. Please also note that such a “new” circuit actually requires a Zobel Network on the output of the secondary of the output transformer. The R and C values should be most probably in the whereabouts of 10 ohms and 220 nF. That should keep the whole thing from falling into high frequency oscillations. Now, all we need to do is take a thick graphite rod (the ones of 5,6mm diameter are the best for this purpose) and build the inductance free current-to-voltage, inductance free, parasitic capacitance free, conversion resistor. Probably the best DIY resistor in the world, actually. We shall need two of such resistors. But how to make those – was covered in one of my earlier texts. As soon as I am ready with the speakers and conduct a practical test of this concept, I shall provide you with an update as to the sonic results of the experiment. Please also note that if we were now to use a 4 ohms output impedance of a speaker, this would essentially change the loop gain of the whole setup. So, for the time being, I just erased the “4 ohms” output speaker terminals from this concept. The 4 ohms speaker connection would actually require a different value of the R_Series resistor (a half of the previous value), for the whole circuit to operate with unchanged gain.